Indisputably one of Britain’s finest rock guitarists, Ritchie Blackmore’s playing was already turning heads back in the early sixties as a member of proto-metal madmen The Outlaws. However it was as a founding member of Deep Purple that his reputation was sealed, and his contributions to their albums from 1968 onwards remain influential to this day. He left the band in 1975 and then launched his own group Rainbow, where he proved himself all over again, with live shows of astounding dynamics which cemented the guitarist’s reputation. A decade later he was back with a reformed Deep Purple to show a new generation of rock fans just why he was so well regarded. Disillusioned by the scene, after briefly reactivating Rainbow Blackmore left the hard rock scene to mellow things out with Blackmore’s Night. This book is an unashamed celebration of Ritchie Blackmore on-stage, with dozens of rare and previously unpublished photographs across four decades. 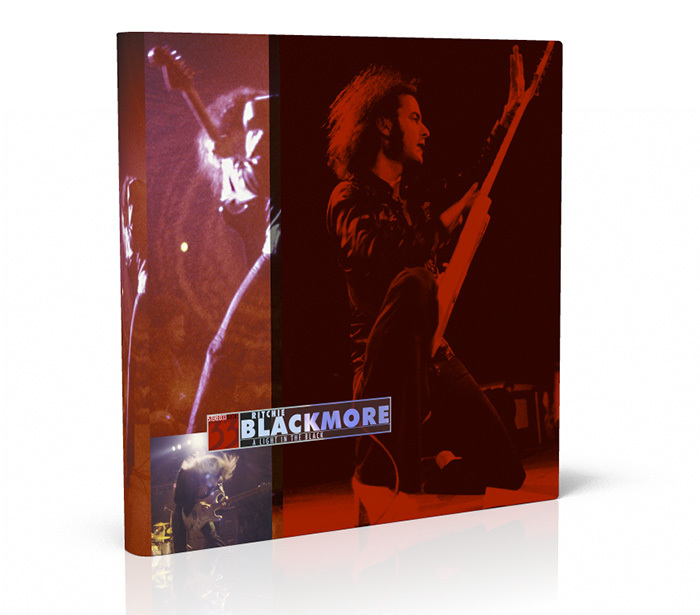 Carefully chosen from archives around the world, and fully annotated (with contributions from fellow musicians) along with accompanying memorabilia, the book will be appreciated by Blackmore followers everywhere and everyone who saw Blackmore during his rock years. The book’s presentation is large format, high quality printing on archival paper, to ensure the best possible reproduction for the material. The full details of the price and any special editions will be released later in the year, and you can join an exclusive mailing list to receive news on progress. This book is being sold via mail-order only and in a limited run. Publication is scheduled for 2018. To be kept up to date on progress, receive details of pre-ordering and other offers connected to the book please send us your email address. You can cancel these newsletters at any time. Note : all visuals on this site are the property of ST33Books. They are for illustration purposes only, may contain copyright material and may differ from the finished printed version. Rainbow Rising, one of the best rock albums made in the 1970’s. And one of the most uncompromising, given the length of side two. No nonsense stuff. Can’t wait to see this book coming out! When is it likely to be issued? This is planned for 2015 Nico as a lot of material to go through! Well, with this book, the Bolin one, Pummers photo book and, the Fire in the Sky one our DP appetites have been well and truly whetted! IF one gets released in 2015 I will be surprised. So Simon, if you were a betting man, which of these books may see the light of day this year? I’m not a betting man Scott! Yes! Being in the US means It will cost twice as much for me. Why do all these great books get published in England? Hopefully the price will be within reach. Looking forward to 2015. When is the book coming? Waiting looooooong time already. Hope it will see the light. We’re hard at work Rob, but two other titles have sneaked in ahead of this! I am waiiting for this photo book release of Rainbow. Especially the offstage photos of the band.I hope its as thick as the didi zill book and with many on/off stage of Rainbow. I hope it just the beginning of other photo book of Ritchie or Rainbow .Saleh from Singapore. Saw I made two comments already in early 2015… book is still in progress?